Consistent with Fromm, Yale sociologist Dr. Steven Kellert and Amherst College professor, Jan Dizard, found that the reasons why people hunt are: “to experience nature as a participant; to feel an intimate, sensuous connection to ‘place’; to take responsibility for one’s food; and to acknowledge kinship with wildlife.” Psychiatrist Karl Menninger, MD, wrote: “Freud fearlessly explored the unconscious layers of the personality, and disclosed that it is no more abnormal for a human to want to kill (in hunting) than it is for a cat to want to kill a mouse or a fox a rabbit”. What are these eminent scientists saying? To me their message is clear: that the violent crimes that humans inflict upon their fellow men in the big inner cities of today’s ever more congested world, are the result of stressed out city people not being able to get ‘release’ from psychological pressures – (social tensions) – by executing their sub conscious natural instinct to hunt. 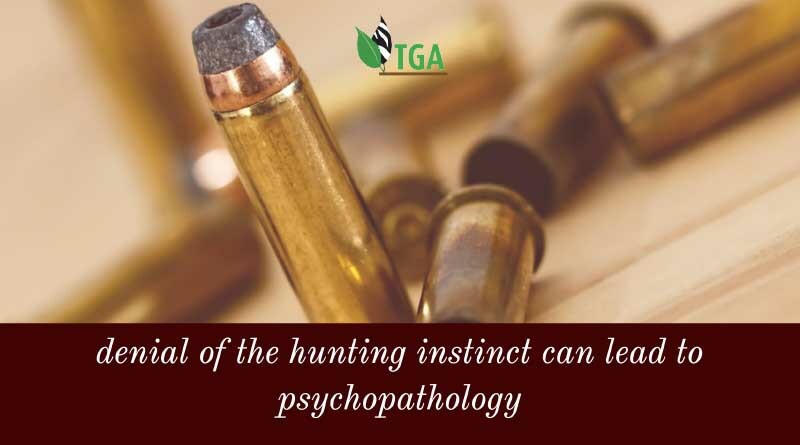 In support of this interpretation, criminologist Chris Eskridge compared hunting license sales with violent crime rates on a county-by-county basis nationwide (in the United States), and he found that “as hunting license sales go up, so violent crime comes down. this is the Truth that PETA and other so-called Animal rights groups don’t want the hoipoloi to understand. With rare exceptions the vast majoirty of Hunters Worldwide are boringly normal, Law abiding Citizens with ‘ordinary’ jobs and a Mortgage. Almost NEVER do Law Abiding Firearms Owners and Hunters ‘break the law’ or ‘behave unethically’. The vast majority of Hunters of my acquaintance are scrupulous in their behaviour while on and off the field and quickly pull up any tyro who oversteps the mark. Its just a pity the World relys on 30 second ‘New grabs’ and sensationalism to fill up the so-called ‘News’ each night. How Stupid, Short Sighted & Crazy is this Burning of Ivory & Rhino Horn?? ?